This spacious three level townhome is surrounded by picturesque views and located in the center of Utah's outdoor adventure mecca! Boasting a large open kitchen for quick and easy meal prep, multiple family rooms, 3.5 bathrooms, and easy access to the community pool and hot tub, Cascade 104 makes it easy to create lasting memories with friends and family. Main Level: Kitchen, laundry room, living room, dining room (seats 8), half bathroom, and entrance to two car garage. Upstairs: Three Bedrooms and two full bathrooms. Basement: One bedroom, full bathroom, sitting room, walk-out patio, and living room with 52" Satellite TV. Bedroom 1: Master suite -1 King Bed, kitchenette, full ensuite bathroom with jetted tub, glass shower, and double vanity. Bedroom 2: 1 Queen bed with shared hallway full bathroom. Bedroom 3: 1 Twin over 1 full bunk bed with shared hallway full bathroom. Bedroom 4: Queen bed, Twin over 1 full bunk bed with a shared hallway full bathroom. Come stay with us in Eden and enjoy some of the best outdoor recreation in Utah and the greatest snow on earth! We are truly excited and honored to share our homes with each and every guest and we invite you to stay with us at Powder Mountain Getaways - C104! Powder Mountain is a unique resort that is sure to blow your mind with its untouched powder, amazing, views, and stellar vibes. 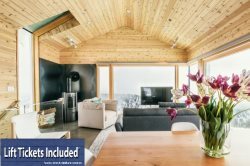 The condos are located in Eden, UT which is approximately 6.3 miles down-mountain from Powder Mountain’s Timberline Lodge. Eden is home to several shops, eateries, a grocery store, and one gas station. We recommend having a rental car during your stay with Powder Mountain Getaways. During the winter months, it is important that you rent a 4x4 or AWD vehicle, and you must be comfortable driving steep snowy roads. Doesn’t sound like your thing? No worries, the state of Utah does run a shuttle bus up and down the mountain, which you can find more about here.